“Oh God, if my time has come, please don't let me linger. I've paid my penance. I've paid my dues.”... My niece, Cathy, comes several times... “No Mom, you go on home. I don't want you to stay.” ...I did the best acting job of my life at 41 years of age. Silent, invisible tears tore through my body. I refused the next oxygen tank. I thanked God again for my family. I waited. I slept the eternal sleep. There is much to Jim's story that I know nothing about, but I can tell you about that day full "of silent tears and a great acting job" because I was there. I am the niece Cathy and I can tell you that it did not happen that way. Not at all. I did not visit Uncle Jim several times, but only once by myself. And that was because my Grandmother - Jim's mother - called me to please go and check on him. And so I did. The visit was rather startling. His voice was full of wonder. And he repeated, “I had a visit from JESUS and I am going to die today! Cathy, tell her NOT TO BE SAD. Be sure to tell her that I saw JESUS and I am so happy. Tell her not to cry. I am very happy. Tell her not to be sad.” His whole demeanor reflected his statement. He was glowing with happiness. There was no mention of any penance. No words of any dues being paid. No tears, silent or otherwise. No begging to not linger. He was the happiest I had ever seen him. Uncle Jim, who did not talk much at all, was ecstatic. Words flowed. He was, well...chatty. My mind was racing “Good GOD almighty. What is this? He has gone nuts.” I decided to use the opportunity to ask him questions, “...and my dad, what sort of a brother is he? and grandpa? and...” the next two hours were full of stories, laughter and jokes, but all the time we were talking I was thinking, “What is going on?” “What IS this?” "Who is this?" I got to the hospital at 11:45 p.m. and a nurse came rushing towards me. “Your uncle has gone Cathy.” I felt so horrible that I had not gotten there earlier; that I had been too afraid. The nurse told me, “No, No don't worry. He knows you are here.” I thought, “What? He knows I am here? What is this?” In a state of confusion and shock I told them to let me call my Uncle Fred so that he could go to my grandparent's house and be there for the phone call. That dreaded phone call. I remember it as if it were yesterday. The FEELING of Jim's happiness and the obvious joy at his knowledge that he “was going” was so astonishing that my world view shifted a bit. But then I forgot. Aaron was seven then and we went to stay with Grandma and Grandpa so that I could keep my deathbed promise to Uncle Jim. Grandma did not react in a surprised nor incredulous way, but only asked me to repeat the story. Again and again. She shared how much she missed being with Jim physically, missed talking to him and sharing jokes. She missed his quick humor and felt lonely in the house without him. But she always said something about knowing that he was fine where he was and being happy for him. Grandma did not cry hysterically, nor did she scream that she wished to die. I did not see overt anguish. None of the behaviors that came to me so naturally 30 years later when that dreaded phone call found its way into my life. I think about this a lot. 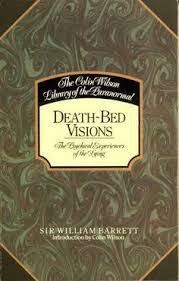 Deathbed visions come in many sizes and shapes but they all point to a reality beyond this one. Our idea of “penance, silent tears, dues paid” is our cultural norm. It is only an assumption. A theory. A belief system THROUGH which we believe that we know about death. A belief system that requires the exclusion of any mention of mystery or beauty, and leaves a pain so terrific that it kills many of us. There is more to death than can be imagined with our current miserable world view and its strict obedience to the Death Taboo. In “A Stolen Life”, Bob toasts his brother Jim with a glass of milk, exclaiming “Here's to you James Arthur Jensen! You showed us how to live and you showed us how to die.” How beautifully true if we would only listen. Uncle Jim was filled with excitement and absolute joy in his knowledge that he was going to “die” and he tried to say it right out loud, through me. I am doing my best to keep all of my promises. Do your own research and be amazed at just how much you don't know. Do not fall victim to "information" that deathbed visions are a malfunction or compensating mechanism of a dying brain. Do not fall victim to the assumption that we can know nothing about death until we die ourselves. Check things out for yourself. Listen...as the door squeaks open.